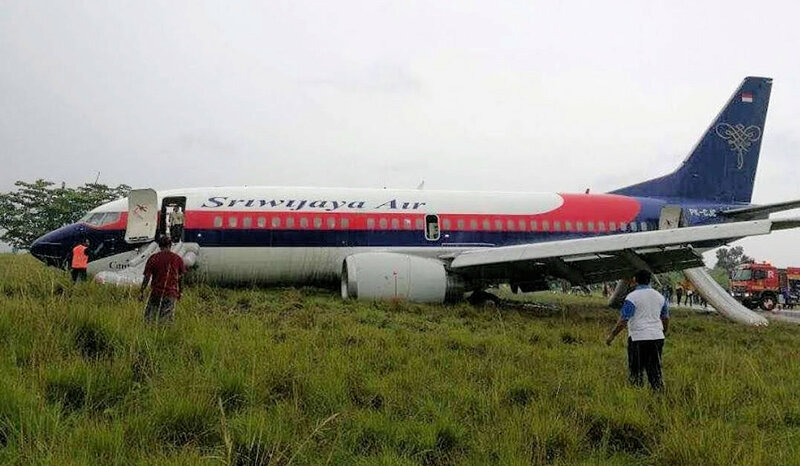 31 May 2017 - 737-300, PK-CJC (24025 / 1556), FF 1988, operated by Sriwijaya Air overran Runway 35 by 30m whilst landing in heavy rain at Rendani Airport, Manokwari, West Papua, Indonesia (WAUU) at 08:51L (23:51GMT). The passengers and crew evacuated the aircraft with only some minor injuries. A company spokesman is reported as telling local media "The aircraft landed at 08:51 local time…at that point of time there was heavy rain, which led to aircraft overrunning the runway. 146 passengers were aboard the aircraft, which was operating flight SJ570 from Sorong to Manokwari." Rendani's only runway, 17/35 is 2000 x 45 meters asphalt. Approach guidance facilities such as PAPI lights and runway lights were all serviceable. Note that on 13 Apr 2010 another 737-300, PK-MDF, operated by Merpati Nusantara also overran the runway at Rendani Airport in rain. The aircraft was destroyed but there were no fatalities. On 19 Oct 2017 the Indonesian KNKT issued their preliminary report, significant extracts of which are reproduced below. On 31 May 2017, a Boeing 737-300 aircraft registration PK–CJC was being operated on scheduled passenger flight by Sriwijaya Air with flight number SJ 570. The schedule flight route was from Hasanuddin Airport, Makassar, South Sulawesi to Rendani Airport, Manokwari, West Papua with a transit stop at Domine Eduard Osok Airport, Sorong, West Papua. At 0220 LT (2020 UTC), the aircraft departed Sultan Hasanuddin Airport, Makassar and at 0815 LT (2315 UTC), the aircraft departed Domine Eduard Osok Airport, Sorong to Rendani Airport, Manokwari. In this flight the Second in Command (SIC) acted as Pilot Flying (PF) and the Pilot in Command (PIC) acted as Pilot Monitoring (PM). On board this flight were two pilots, four flight attendants and 146 passengers. There was no report or record of aircraft technical system abnormality prior to the departure from Makassar until the time of occurrence. During landing at Manokwari at 0850 LT (2350 UTC), the weather condition was slight rain with Cumulonimbus cloud viewed nearby the airport. The aircraft touchdown then overrun and stopped at approximate 20 meters from end of runway 35. Some passengers had minor injury and the aircraft suffer substantially damage. The investigation is continuing and will include details information of flight recorders, related procedures, human factors issue, flight technique and airport infrastructure and procedure. In this Preliminary report, KNKT issued safety recommendation to PT. Sriwijaya Air, Rendani Airport, and Directorate General of Civil Aviation to address the identified safety issues. On 31 May 2017, a Boeing 737-300 aircraft registration PK-CJC was being operated by PT. Sriwijaya Air as a scheduled passenger flight from Hasanuddin Airport (WAHH), Makassar, South Sulawesi to Rendani Airport (WAUU), Manokwari1, West Papua, with one transit stop at Domine Eduard Osok Airport (WASS) Sorong, West Papua. The flight was uneventful since the first departure from Makassar until commencing the approach at Manokwari. At 0815 LT (2315 UTC2), the aircraft departed Sorong to Manokwari. On board in the flight were two pilots, four flight attendants and 146 passengers. On this flight, the Second in Command (SIC) acted as Pilot Flying (PF) and the Pilot in Command (PIC) acted as Pilot Monitoring (PM). At 2331 UTC, the pilot made first contact to Rendani Tower controller and informed that the aircraft was descending from FL 230 (altitude 23,000 feet) and requested the weather information. The Rendani Tower controller informed to the pilot that the wind was calm, ground visibility 6 km, cloud3 FEW CB 1,400 feet, temperature and dew point 26/25°C. At 2336 UTC, Rendani Tower controller instructed to the pilot to descend to 11,000 feet and to report when on Visual Meteorological Condition (VMC). At 2338 UTC, the pilot informed that they were on VMC condition and passed altitude 13,000 feet while position was 32 Nm from ZQ NDB (Non-Directional Beacon). Rendani Tower controller instructed to fly maintain on visual condition, fly via overhead, descend to circuit altitude, join right downwind runway 35, and to report when overhead Manokwari. At 2344 UTC, the pilot reported that the aircraft was over Manokwari and Rendani Tower controller informed to the pilot that the visibility changed to 5 km. Two minutes later Rendani Tower controller instructed to the pilot to continue approach and to report on right base runway 35. At 2349 UTC, at approximately 600 feet, the PIC as PM took over control by called “I have control” and the SIC replied “You have control”. A few seconds later the pilot reported that the aircraft was on final runway 35, and Rendani Tower controller instructed to the pilot to report when the runway 35 insight. The pilot immediately replied that the runway was in sight and acknowledged by Rendani Tower controller who then issued landing clearance with additional information that the wind was calm and the runway condition wet. At approximately 550 feet, the PIC instructed the SIC turn on the wiper and reconfirmed to SIC that the runway was in sight. Between altitude 500 feet to 200 feet, the EGPWS aural warnings “Sink Rate” and “Pull Up” sounded. At 2350 UTC, the aircraft touched down and rolled on runway 35. The spoiler deployed and the pilot activated the thrust reversers. The crew did not feel significant deceleration. The aircraft stopped at approximate 20 meters from the end of runway pavement. After the aircraft stopped, the PIC commanded “Evacuate” through the Passenger Address (PA) system. The Rendani Tower Controller saw that the aircraft was overrun and activated the crash bell then informed the Airport Rescue and Fire Fighting (ARFF) that there was an aircraft overrun after landing on runway 35. There were 17 minor injuries to passengers. The aircraft was substantially damage. The damaged found on the nose landing gear, nose section lower fuselage, and both engine fan blades. The Pilot in Command (PIC) was 49 years old Indonesia male pilot, joined the company since 2005 and held valid Airline Transport Pilot License (ATPL). He had 13,371 hours including 3,110 hours on type. The Second in Command (SIC) was 42 years old Indonesia male pilot, joined company since 2010 and held valid Airline Transport Pilot License (ATPL). He had 5,570 hours including 2,523 hours on type. The aircraft manufactured by Boeing Company in 1988 in United States of America, with serial number 24025 and the type/model was B737-33A. The aircraft registered PK-CJC had Certificate of Airworthiness (C of A) valid until 24 July 2017 and Certificate of Registration (C of R) valid until 12 April 2020. The last inspection (A9 Check) was conducted on 21 May 2017 when the aircraft at 60,996 flight hours. The navigation aids available at Manokwari was Non-Directional Beacon (NDB) with identification ZQ. There was no NDB instrument approach procedure available in Manokwari. Approach guidance facilities such as Precision Approach Path Indicator (PAPI) lights were serviceable. The RNAV5 (Area Navigation) approach chart provided by Directorate General of Civil Aviation (DGCA) on Aeronautical Information Publication (AIP) Volume III is showed as the figures below. The aircraft was fitted with L3-Comm A200S model with part number S200-0012-00 and serial number 02700. The recorder was transported to KNKT recorder facility for data downloading process. The CVR recorded 120 minutes of good quality recording data including the accident flight. 23:49:40 Rendani Tower controller acknowledged and issued landing clearance with additional information that the wind was calm and the runway condition wet. 23:50:04 PIC requested to the SIC to turn on the wiper. The aircraft stopped with the main wheels were at approximates 20 meters from end of runway 35 and all emergency exit slides deployed. The aircraft was substantially damaged, nose landing gear broken and folded backward into the electronic compartment, both fan blades on engine found damage, and damage on some fuselage areas. Reverted rubber marks found on the main landing gear tire. Observation on the runway found white tire marks on the aircraft trajectory. The aircraft was airworthy prior to the accident, there was no report or record of aircraft system abnormality during the flight. The aircraft had a valid Certificate of Airworthiness (C of A) and Certificate of Registration (C of R). The aircraft operator had a valid Air Operator Certificate (AOC) to conduct a scheduled passenger transport. The crew held valid licenses and medical certificates. The weather conditions during aircraft approach and landing was slight rain with cumulonimbus viewed nearby the airport, wind was calm and runway was wet. In this flight Second in Command (SIC) acted as Pilot Flying (PF) and the Pilot in Command (PIC) acted as Pilot Monitoring (PM). The PIC took over control from the SIC during approach at altitude approximately 600 feet. At approximate 550 feet, the PIC instructed the SIC to turn on the wiper and reconfirmed to SIC that the runway was in sight. The CCTV recorded water splash when aircraft on landing roll. Several area of the runway warp in approximate 2 - 5 meters square meters with standing waters on the runway of Rendani Airport. Several runway lights covered by grass with the height approximately of 30-40 cm. Rendani Aerodrome Manual (AM) as general guidelines in the airport operation had not been approved by the DGCA at the time of accident. Rendani Airport (WAUU), Fire fighting category III refer to AIP amended on April 2015.